My world turned upside down at 7:00 on the morning of March 8 as I stood in the shower. A lump in the breast. A moment of panic. So begins a journey that every woman fears. “There must be more out there to life. The moment I found my lump in the bathtub, I knew it was cancer. I thought breast cancer was a death sentence. I didn’t know that most women who get breast cancer live a long life. But you know, the woman I was two years ago died. And the real me was born. As soon as I am able to touch it, I resolve to caress this flatness. My chest, my dead-feeling armpit, my arm, all that remains. I run my fingers over the area, petting it, caressing it, letting it know that I am not angry, that it is still my body, that I still love it. I tell a friend that I am doing this, caressing the place where there is no longer a breast, for which there is no name. I press my fingers gently all around the scar, I squeeze my armpit. My friend is surprised. But if I cannot love my body, I cannot heal. Holy Mystery! Grant me healing. An individual doesn’t get cancer, a family does. …with one breast or none, I am still me. than the number of my breasts. It’s all right to cry, but not for too long. I made it, and so can you. But I’ve been writing letters, making phone calls, “announcing” my condition to the world: I want “everyone” to know—as if their affection and good wishes would keep me safe. And closer to them. •Participate in Breast Cancer Awareness events. •Wear a pink ribbon in solidarity with women who have breast cancer. •Do a breast self-exam and encourage a friend to do one. •Schedule a mamogram, if you need one. •Donate to a group that works with women with breast cancer. 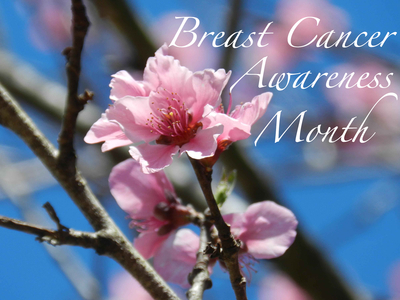 •Raise awareness about breast cancer: tweet about National Breast Cancer Awareness Month. •Add information about breast cancer screening to your newsletter. •Go on a breast cancer walk with friends. •Search online and learn more about breast cancer. •Explore environmental causes of cancers and help to eradicate them. What does it mean to say I have survived until you take the mirrors and turn them outward and read your own face in their outraged light? Living a self-conscious life, under the pressure of time, I work with the consciousness of death at my shoulder, not constantly, but often enough to leave a mark upon all of my life’s decisions and actions. And it does not matter whether this death comes next week or thirty years from now; this consciousness gives my life another breadth. It helps shape the words I speak, the ways I love, my politic of action, the strength of my vision and purpose, the depth of my appreciation of living. Diann L. Neu of WATER has written prayers and rituals, journaling and resources for women with cancer and their families. You can order them from WATER. @ $10 each + $2 shipping & handling. _____Send me “Seasons of Survival: Prayers and Rituals for Women with Cancer” @ $10 each + $2 shipping & handling. _____Send me “Seasons of Compassion: Resources for Companions of Those Needing Healing”Prayers and Rituals for Women with Cancer” @ $10 each + $2 shipping & handling. © Diann L. Neu, D.Min., MSW, is Co-founder and Co-director of WATER. dneu@hers.com. This ritual is based on one in “Seasons of Healing: Prayers and Rituals, Journal Writing and Resources for Women with Cancer” by Diann L. Neu, available from WATERworks Press.